Mobile is a city located in the territory of Alabama. The city of Mobile is the center of Mobile County. The town is located near Mobile River. 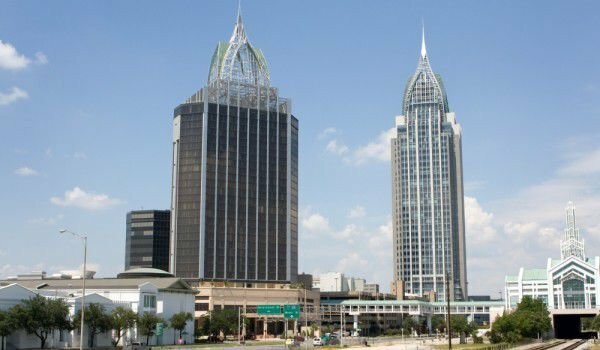 The population of the city of Mobile is about 195 000 people. In 1702 the town of Mobile was the first capital of colonial French Louisiana. The town is named after the ancient Indian tribe Mobilian. French colonists discovered the tribe when they arrived in Mobile Bay. Mobile was for one hundred years a colony of France, then became a colony of Britain and eventually became a colony of Spain. In 1810 the town became part of Mobile, USA. In 1702, Mobile was still known as Fort Louis de la Louisiane. The fort was founded by French Canadian Pierre Le Moyne d'Iberville and Jean-Baptiste Le Moyne, Sieur de Bienville. He was elected governor of French Louisiana. In 1704 to the fort were brought over twenty Frenchwomen, but also yellow fever. The women managed to survive, but many residents of the fort died of disease. At that time, were imported first brought African slaves. In the early colony were almost three hundred people who were halved because of illness in 1711. Because of the danger of continuing epidemic, the town was moved a few miles down the river, where it is today. Fort Louis was built anew. In 1712 the population of the fort grew to four hundred people. In 1720 the capital of Louisiana was moved to Biloxi, and Mobile became a commercial and military center. In 1723 construction began on a new fort - from bricks and stones. It was renamed Fort Condé in honor of Louis Henri, Duke of Bourbon and the Prince of Condé. In 1763 ended the war between the Frenchmen and Indians. At that time, Mobile and the territory around it became a British colony. The British changed the name of Fort Condé and named it Fort Charlotte, the name of the wife of King George III- Charlotte of Mecklenburg-Strelitz. British residents were tolerant of the fort’s people, who were Frenchmen, because they do not want the Fort to be abandoned. In the fort remained one hundred and twelve Frenchmen. In 1763 to the city came the first Jews. This was a manifestation of religious tolerance, as in colonial French Louisiana Code Noir is complied with, which means one is not permitted to profess any religion except Roman Catholic, and all Jews were expelled from the French colonies. Jews who arrived in Mobile, greatly contributed to economic development and trade in the city. In 1766 the population increased to eight hundred and sixty people. In 1780 the Spaniards took over Mobile after the Battle of Fort Charlotte. The fort received a new name - Fortaleza Carlota, and Spanish Mobile was made a part of Spanish West Florida. In 1813 the town was captured by Gen. James Wilkinson. The city became part of the Mississippi territory. At that time, in the city lived only three hundred people. In 1817 the town became part of the Alabama territory, which in 1819 received the status of a state. At that time the population exceeded eight hundred. The city developed rapidly and in 1822 the population was already nearly three thousand people. Today it is the only port in the territory of Alabama. The port for many years played a key role in the economic development of the city. It has been a key commercial center at a time when local Indians and Frenchmen exchanged goods. Today the port of Mobile is the ninth largest port in the United States. In the city are many museums of art, here is the building of the opera, the ballet and symphony orchestra. The city regularly organizes a carnival - these are the oldest organized Carnival celebrations in the U.S. They are practiced since the eighteenth century.